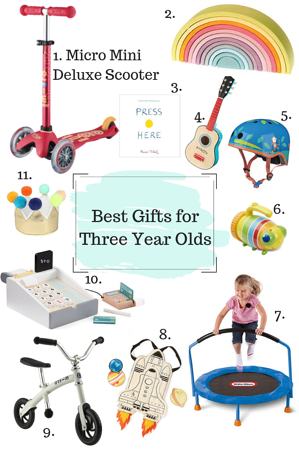 Want to know what the best gifts for a 3-year-old look like? Here they are! 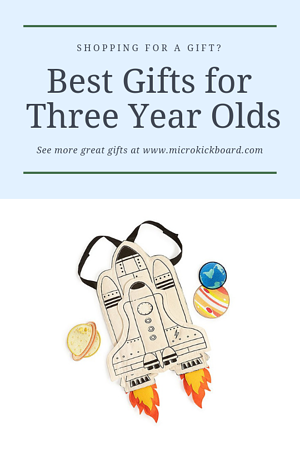 Gifts for 3 year olds can be difficult to choose, so take the guesswork out of the equation and choose from our highly curated list! As the highest rated kids scooter, there’s no wondering why this is our top choice. Kids love the variety of colors to choose from, and the intuitive lean-to-steer system. To kids, it’s just fun, but thought has gone into every aspect of the Micro Mini. The deck is just an inch off the ground, allowing for even the littlest 3-year-olds to easily step on and off their scooter. 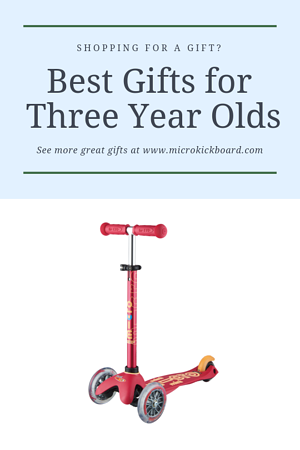 The grips are ultra-comfortable for little hands, and the thick PU wheels help the scooter to glide over bumps. 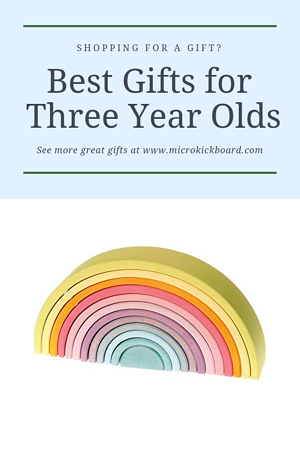 It’s surely the best value present you’ll buy your child, as the adjustable T bar grows with ages 2-5. 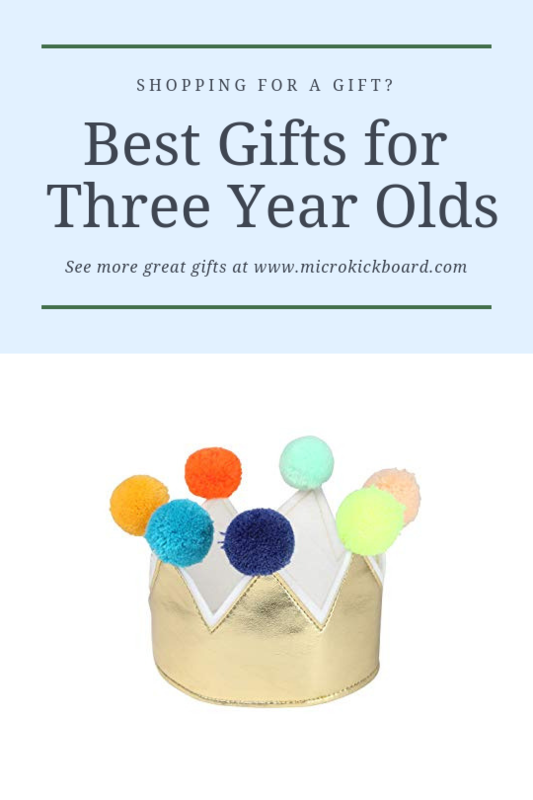 Give your 3-year-old the best! 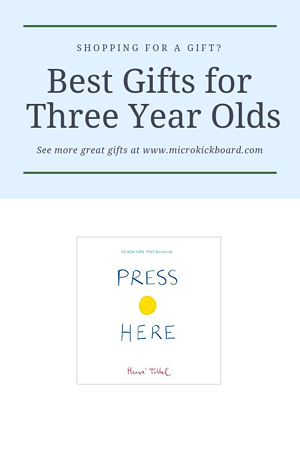 As your 3-year-old’s brain develops, they’ll have an interest in figuring EVERYTHING out. Consider this the beginning of their “why” stage because they’ll be asking about everything! This rainbow stacker toy is a great first puzzle for your little one. They’ll spend endless amounts of time pulling it apart and putting it together in new ways. This beloved kids book is great for a 3-year-old. They’ll squeal with delight as they push the “buttons” to turn from page to page. A cross between a game and a book, this book is a great addition to your child’s bookshelf. Musical instruments are a popular gift for 3-year olds, as their interest in language and noise develop. 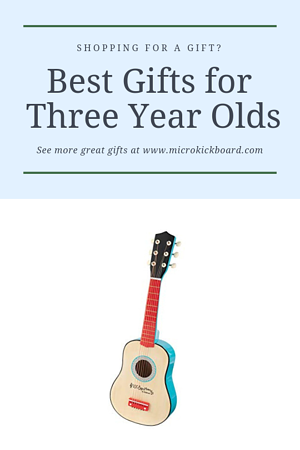 This toy guitar is a great size for toddlers and offers fun for years to come. 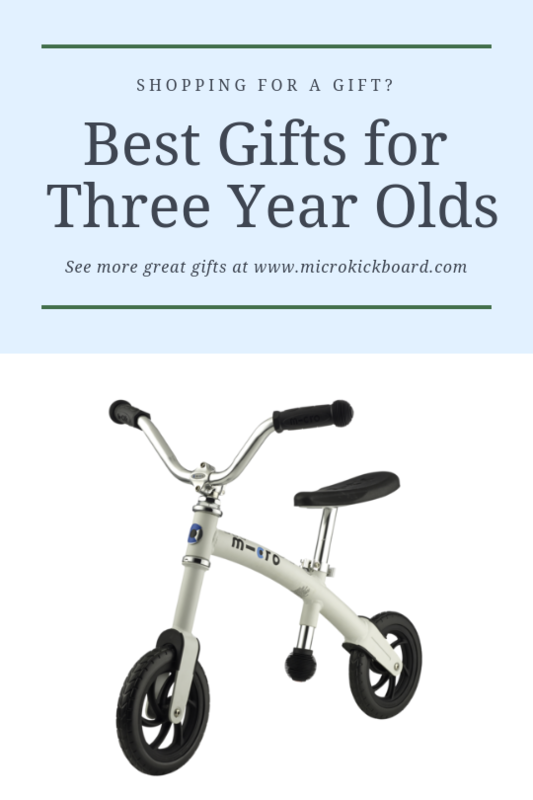 Whether your 3 year old is cruising on the Micro Mini Deluxe, or G Bike Chopper balance bike, safety is paramount! 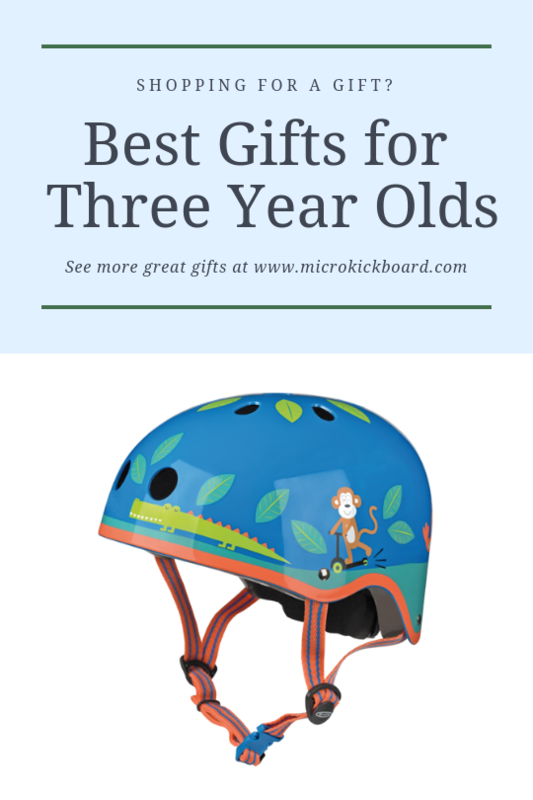 A helmet is a great gift for an adventurous kiddo. We carry a variety of fun and stylish designs in multiple sizes. Adventure is out there! Help your 3-year-old find it with this cure kids buggy flashlight. 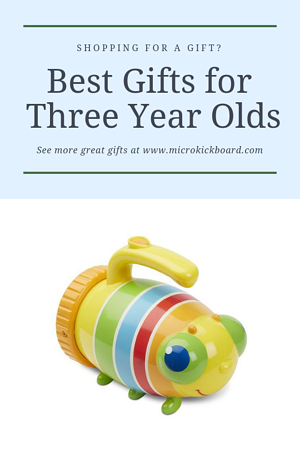 The handle allows for easy holding, perfect for a toddler’s grasp. Oftentimes 3-year-olds have what seems like unlimited energy. 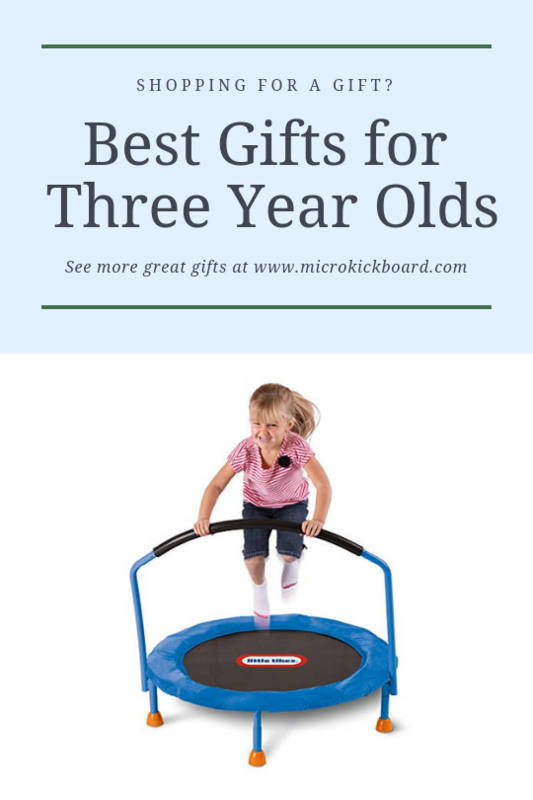 Help them get it out in a fun and healthy way with this toddler trampoline with handlebar. Up your toddler’s interest level in science, physics, and the unknown with this space themed adventure cape. Children of this age tend to thrive when engaging in imaginative play, and this cape helps encourage them to reach for the stars. The cape is customizable with rocket flames, planets, and stars to help any 3-year-old exercise their creativity. As 2-year-olds continue working on their balance, many parents have found great use in balance bikes. This model is ideal for children ages 2-5 and features chopper-style handlebars which limit the steering radius, providing more stability for young children. At just 6lbs, it’s the lightest balance bike on the market. Adjustable handlebars and seat help to accommodate between siblings, or as your child grows. Inserting themselves into the adult world is a great way to help 3-year-olds to develop a sense of self. And there’s something about a cash register that can please any toddler. 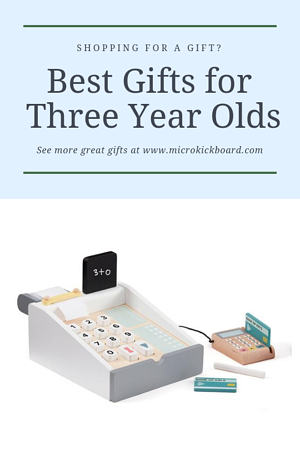 This wooden option is super cute and comes with chalkboard total screen, and credit card slider. There’s not much that’s more fun to a 3-year-old than dress up, and what better costume is there than royalty? This kids crown from Meri Meri is the perfect accessory to help encourage your little one’s imagination to run wild.